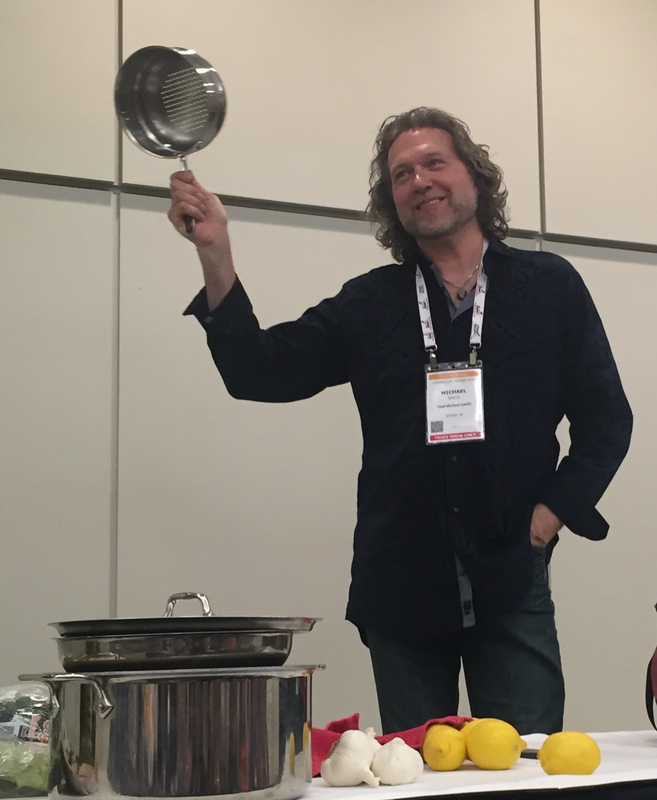 At the annual Canadian Produce Marketing Association convention in Toronto, Chef Michael Smith brought his kitchen to us! Take a peek at his top 10 must-have kitchen tools! 1. A good cookbook. Hands down, the Chef’s favourite cookbook is The Joy of Cooking by Irma Rombauer. He calls this his scrapbook. It’s a timeless essential for new and experienced cooks alike. 2. 3 pots with lids. A big pot, a small pot and a fry pan. Simple as that. Smith is a fan of ceramic non-stick pans over Teflon. 3. A steamer. Because steaming veggies is “just best way to cook them,” says Smith. 4. 3 knives. A chef’s knife, a serrated knife for cutting toast, and a small knife. 5.	Pepper grinder. According to the Chef, pepper tastes so much better when freshly ground. 7. Lemon reamer / citrus reamer. Because a little bit of fresh juice goes a long way! 8. Wooden spoons. They’re versatile and multi-purpose. 9. Wooden cutting board. Smith prefers the natural look of a wood cutting board over plastic. 10. Kids’ chef tools. Smith’s youngest daughter has a plastic whisk. It doesn’t work very well, but it gets her in the kitchen every Saturday morning to make pancakes with Dad. Posted in Fascinating Food Facts, Healthy Eating, Heart Health, News & Trends | Tagged Canadian Produce Marketing Association, Chef Michael Smith, dietitian, kitchen tools, Nutrition Solutions, Sue Mah.